Our brides often ask us about when they should start alterations, pricing, and if certain alterations are possible. Below are a few of our most frequently asked questions. Keep in mind you will be working with a certified pattern maker and design school graduate, thus our timeline and pricing will be different than most typical alterations places. If you don’t see your question below, don’t worry; simply call or email with your questions. 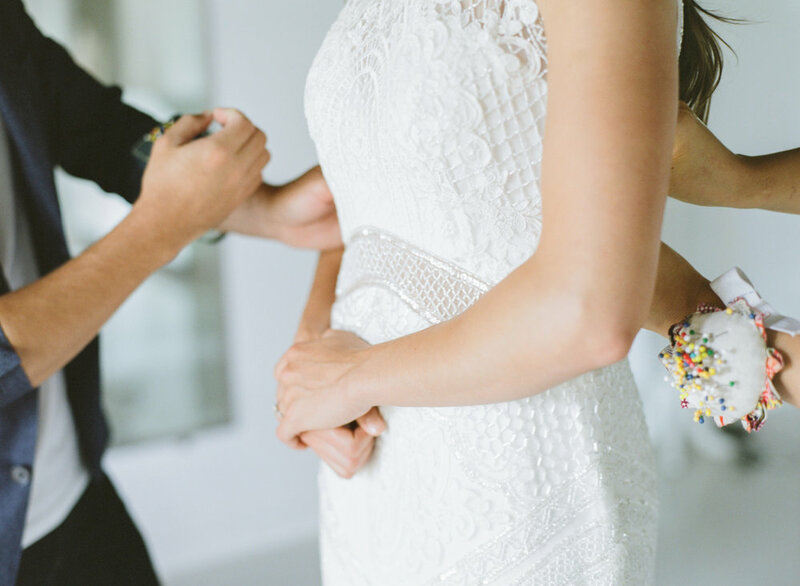 When should I have my dress altered? The short answer is, when your size and weight are stable. If you are undertaking a diet or weight loss program, we’d advise you to set a goal date for stopping and stabilizing your size and weight, then book your appointment for that time. We require the first appointment to be at least three weeks before the wedding. If your size is very consistent, it would be fine to have your dress altered 3-4 months before the wedding. How long does it take to get my dress back? Our turn-around time is 5 days for most typical dress alterations. Careful scheduling, allows us to work on your dress right after your fitting, while all details are still fresh in our memory. To do this turnaround so quickly, we have to be very organized with our appointments. Please make sure you arrive on time and if you need to reschedule, kindly do so as far in advance as possible. What if I lose/gain weight right before the wedding? Although many brides ask this question, it’s not something you should be too worried about. In our experience, this rarely happens to the extent that the dress no longer fits well. We recommend our brides to try their dress on periodically after alterations and to call us right away if the fit changes. Is it possible to take a dress from a size 10 down to a size 2? Most likely. We’ve done it many times with sample dresses, although some aspects of the design may need to change in the process. These alterations will often require more time and thus more expense to complete. If you’re in doubt text or email us photos of you wearing the dress and include detail photos around the entire bodice. It all depends on how long the work takes. We bill at the rate of $84/hr for the first 8 hours of work and $64/hr thereafter. Most dress alterations cost somewhere in the $300-$900 range. The most expensive dress customization/alterations we do are in the $1000-$2000 range and involve several days of custom making pieces and/or delicate lace and bead work. Custom made items; sleeves, illusion necklines, jacket/bolero, veils, etc. How many fittings/appointments do I need? For most standard alterations (not including custom made items) we are able to complete all the work in 5 days, with only two appointments. Custom made items or major alterations, may require additional appointments. We will let you know in the first fitting if we feel these will be necessary. Please be sure to include a description of what needs to be done to your dress when you book the appointment and if we feel you’ll need additional appointments, we will go ahead and block off the time.